At the Nyumanzi Transit Center in northern Uganda, refugees greet U.N. High Commissioner for Refugees Filippo Grandi with song and dance, as well as with tales of food shortages and poor living conditions. Grandi is on a tour of Uganda's overcrowded refugee centers. Since violence began last July, nearly 90,000 South Sudanese have crossed into Uganda seeking shelter. Originally intended as a quick waypoint before settlement, Nyumanzi currently houses thousands of refugees in makeshift tents. 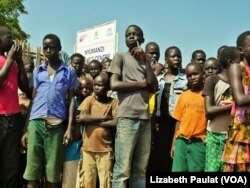 One family from Pageri, South Sudan, says life has been difficult. "Because every day we are [here] almost two months. Everyday beans, no change," one man said. "And food is not enough," chimed in a woman. "No blanket, no saucepan for cook, even no bucket," the man added. The government is trying to ease congestion by transferring refugees to Bidibidi, a new settlement that can house 100,000 refugees. Yet fears of underdeveloped infrastructure, sanitation, possible spies and violence has many refugees too afraid to resettle, many saying they would rather return to South Sudan. Children at Nyumanzi Transit Center await the arrival of Grandi. The UNHCR says the vast majority of refugees are women and children. A number of refugees say that when they resisted transfer last month, police shot tear gas into the camp. The UNHCR says it is unaware of any event during which police fired tear gas at refugees. The agency also says while building continues at Bidibidi, refugees can be assured they will have access to water, food and shelter in the new camp. 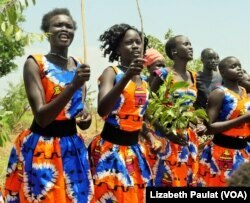 South Sudanese women at Pagirinya Refugee Settlement wore bright costumes, welcoming the UN High Commissioner with song and dance. Grandi says the Ugandan government has done a remarkable job settling new refugees, but the world must pay attention to the emergency in Uganda. “Nowhere in the world I have seen people settled with land and with the beginning of shelter in less than two months," he said. "Twenty-two thousand here in Pagirinya alone, and that is not the only group... but I want to warn everybody if we do not get more resources and the influx from South Sudan continues it will be difficult to maintain these levels and to continue the response for the new waves that will come." Grandi said the international community should respond to this crisis the same way it responded to the migrant crisis in Europe. "There, we are funded 60-70 percent, here 20-30 percent. This is not right. We need to put this right,” he said. Uganda is home to around 570,000 refugees, mostly from Congo, Burundi and South Sudan. And although most South Sudanese say they long to return home, there has been no indication of when the violence there will end.